A STURDY, white-bibbed bird about the size of a thrush, the dipper provides scientists with an accurate indication of the general health of the rivers and streams. 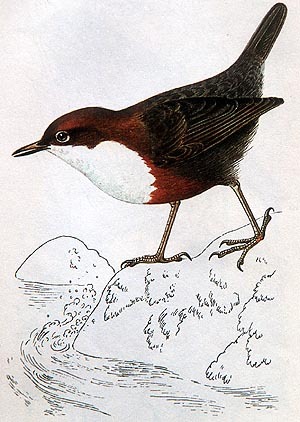 Dippers patrol the beds of shallow, fast-flowing streams in search of insect larvae, fish fry, fresh water shrimps and molluscs such as water snails. They walk along the bottom, sometimes completely submerged and manage to stay underwater by holding their wings at an angle and clinging to pebbles with their toes. The nature of their diet makes dippers very sensitive to pollutants in the water. As chimneys on factories and power stations grow ever higher, sulphur dioxide, nitrogen oxides and other emissions are wafted across greater areas and remain in the atmosphere longer. They return to earth as part of acid rain, polluting trees and hillside, and are eventually washed into waterways. Here, algae are the first to be affected, then the creatures that feed on them. If the water is polluted, it will eventually kill all the resident animal life, including the large fish. The dipper population, an integral part of this foodchain, decreases, then disappears. Scotland receives high levels of acid rain, and its underlying rocks, hard and lime free, do not buffer lakes and rivers against the acidity. A study conducted there found that pairs of dippers breeding along polluted rivers and rivulets produced fewer and lighter eggs, and these too later in the breeding season. They fed their chicks less often than usual and, as a result, the chicks had a slimmer chance of surviving. In normal circumstances, dippers can lay two clutches of eggs a year but these parents only managed one. Moreover, it was discovered that the dippers breeding success has a precise cut-off point  it breeds best if the water is clean and the level of acidity measures 6.5 or above (pure water has a level of 7). But it does not breed successfully if the water is so acidic that the level is below 6.5. These birds have a dense, waterproof plumage which protects them from getting soaked. To protect their eyes they have transparent membranes which actually are transparent third eyelids. While entering the water dippers simply walk straight into the stream and disappear below the surface. Found in Asia, Europe, North Africa and North, Central and South America, they build their nests in a wall beside a brook, in cracks under footbridges, in holes between rocks and sometimes even behind a waterfall. They build domed-shaped nests with side entrance. These nests which are built near fast-flowing streams  their feeding-ground  are also difficult for stoats and other predators to reach. Black-headed grosbeak, a member of the different family than dipper, has a very specialised diet. It can eat monarch butterflies indiscriminately without having any ill effect. This North American butterfly is quite poisonous and most bird species avoid it, but there are some species who have developed partial or total immunity to these toxins which the butterfly derives from the leaves of milkweed plants. Caterpillars of these butterflies feed on the above plant and in the process ingest large amount of toxins which are produced by the plant. These poisons are stored in the body and are retained when they pupate and become butterflies. How the bird has specialised in eating monarch butterflies, that too without suffering any ill effect remains a mystery. There are six species of grosbeaks which are found in North Central and South America. These stocky, large-billed finches are found in many colour combinations such as orange and black, yellow and black or red, white and black. Nesting in bushes and trees grosbeaks inhabit forest edges, cultivated land and scrubs feeding on fruits, seeds and insects. Some of the species are migratory.